Roll pie dough into a 12-inch circle. Place in a 9-inch pie pan and trim edges to extend 1 inch beyond the rim. Tuck edges under and crimp. Freeze while making rosettes. Roll one or two strips of butternut squash together like a cinnamon roll. Depending on the tightness of your roll, you’ll need 35 to 40 roses. Place roses to the side. Place pie pan on a rimmed baking sheet and line pie dough with parchment paper. Fill with pie weights or dried beans. Bake for 10 minutes. Reduce oven temperature to 350°. In a large frying pan, melt butter over medium-high heat. Add mushrooms and cook until lightly browned, about 5 minutes, stirring frequently. Add leeks and cook until tender, about 4 minutes. Season with salt and pepper. Carefully remove parchment and pie weights from crust. Spread mushroom mixture in the bottom of the crust. Sprinkle with cheese. Place butternut squash roses on top, open end facing up some space between them. Bake for 45 to 50 minutes, or until edges of crust are golden brown and center is firm and set. Serve immediately. In a large bowl, mix together flour, sugar, and rosemary. Toss in butter cubed. Cut in using a pastry blender or use your hands by pressing cubes between your thumb and pointer finger. Continue until butter pieces are small, about the size of a small lima bean. Pour water over flour mixture and slowly fold in using a fork. Continue until a shaggy dough forms and only a small bit of flour remains loose and crumbly. Shape dough into a disk, folding dough over itself a few times if needed, and wrap tightly in plastic wrap. Chill for 1 hour or up to 2 days. Using a vegetable peeler, remove outer skin of squash. Working from one end to the other, shave long strips of squash. Place a piece of squash flat on your cutting board and roll tightly from one short end to the other. Place roll on the end of another strip and roll the strip around it. Repeat until enough roses have been made to cover the pie’s bottom. I know I talked a bit about persimmons last year, but I keep meeting people that don't know what they are or don't like them because they've had a bad experience eating an astringent one. So, I'll be posting a few persimmon based recipes as we lead into winter. 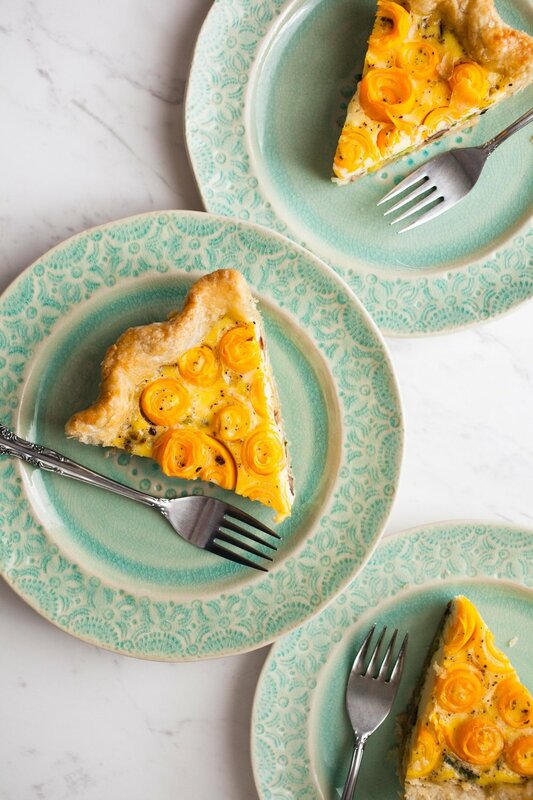 For those of you who don't fawn over pumpkin everything, persimmons may just be the "basic" obsession you need. When ripe, they have a honey-like sweetness that is delicious and unique for a winter fruit. This particular variety is not astringent (causing a chalky mouth feel) so it can be eaten when less ripe, but their sweetness deepens as they ripen. As the persimmon ripens, the color will become richer and the flesh will start to give slightly - similar to a slightly under ripe pear. Serve raw or cooked. Nutrition: Rich in potassium and Vitamins A and C. Also a good source of antioxidants, fiber and Omega-6. Season: October & November; through winter in warmer climates. For this Persimmon and Apple Crumb Pie, you'll want to find richly colored Fuyu persimmons that are still firm. You can tell if they are the right ripeness by placing one in your palm and gently giving it a squeeze - it should feel like an apple. If this is your first time working with persimmons, keep the stem end on while peeling and slicing. This will give you something to grip and ensure your hand doesn't slip (while I'm sure the ER doctors are lovely, please don't go visit them). You can use a standard vegetable peeler and peel the fruits just like you would an apple. There is no thickening agent added to this pie, something which any pie maker might find odd. 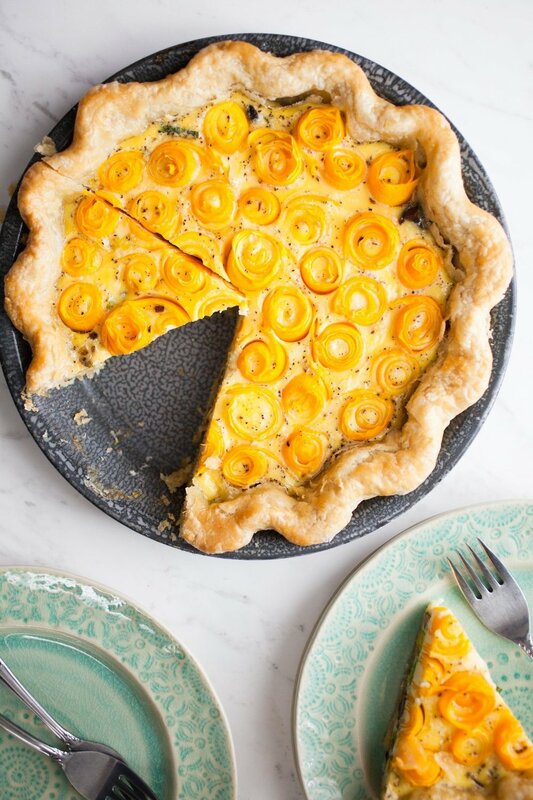 Persimmons are very high in pectin and since the fruit macerates and the juiced are then reduced, there's no need for extra cornstarch or flour. Peel and slice the persimmons and apples into thin rounds (1/4” thick). If you have a mandolin, keep the stem end on the fruits to use as a hand guard and guide. Deseed any slices if necessary and place in a gallon size zip-top bag or other airtight container. In a small bowl, combine both sugars and all dry spices. Sprinkle over the fruit. Pour in the orange juice and toss to fully coat. Seal the bag, making sure to press out any air, or press a sheet of plastic wrap onto the surface of the fruit and seal with the lid. Place in the refrigerator for at least 6 hours or overnight. Roll out the pie dough and place it in a 9” pie pan. Crimp or decorate the edges as desired. Place the prepared crust in the freezer until ready to fill. Strain the sliced fruit, collecting the syrup in a bowl. Place the syrup in a small sauce pan over medium-low heat and bring to a low simmer, stirring occasionally. Cook until the liquid thickens and becomes the consistency of cold maple syrup. Remove from the heat and set aside. To make the crumb topping, mix together flours and sugar. Add the butter to a small saucepan over medium-low heat. Stir as the butter melts and bubbles. Continue stirring and cook until the butter solids start to brown, about 3 minutes. Remove from the heat and stir in the vanilla bean scrapings or extract. Pour the browned butter over the flour mixture, mixing with a fork until the ingredients are no longer dry and have formed small clumps. Remove your pie crust from the freezer and brush the edges of the crust with the egg wash, if desired. Fill the pie by evenly layering in the sliced fruit. Some of the persimmon slices may have stuck together, so gently peel them apart. For any groupings that are falling apart instead of pealing away from each other, don't worry about separating them. Pour the reduced syrup over the fruit and spread the crumb topping evenly over the pie. Place on a parchment lined sheet pan in the middle of your oven for 35-40 minutes. The pie is done when the juices begin to bubble up along the edges of the filling. Cool on a rack for at least 1 hour before serving. This pie is excellent served with a scoop of vanilla bean ice cream or freshly whipped cream. Yield: 9" pie - about 8 servings // Store in the refrigerator loosely wrapped in plastic for up to a week. To many families, holiday traditions just aren't complete until Grandma's (or Aunt Martha's, or Uncle Pete's) pie has been passed around the table. Like an heirloom, these revered recipes often come to us from generations past and connect us to the larger whole of our family. I grew up with two Southern grandmothers (well, one was technically Cuban but adopted by the south), so my family is certainly not short on heirloom recipes. However, a good holiday pie is conspicuously absent, so this season I set out to create one. I came up with a few tips during this process that I'd like to share so that you can start your own holiday tradition. Ok, I know that the hardest part about putting a pie recipe together can be knowing where to start. It can be so frustrating to put in the work peeling all of those apples and rolling out crust only to end up with flavors that just don't dazzle. My suggestion here is to start with some small-scale tests. Cooking apples with a few different spice mixes on the stovetop is quick and an easy way to experiment without having to commit to a whole pie (side note: this technique is also great for a stand alone dessert on those nights when you wanna be easy but still treat yo'self). I've broken this process down to a few simple steps and put them into a guide to help you organize the process. Follow the recipe below for making your full heirloom pie! Note about scaling: Small scale tests may not always translate perfectly to the full-size version. I recommend trying to use the same size apples in your pie that you tested. Or, given that apples naturally vary in size, premix your spices to your full scale and add them into your apples a teaspoon at a time - this is mostly important for your first full-scale pie. If you track your teaspoon measurements, you can make up a big batch of heirloom pie spices and just list your recipe as "3 tsp of family spice mix." This would be a great thing to keep on hand or give a jar along with the pie recipe to your family as a personalized gift (and win best gift giver of the year). Share your family's creation with #heirloomapplepie and #ofthedirtrecipes! Preheat oven to 415 F.
Peel, core and slice your apples into ⅛ - ¼” thick slices. Cut into bite-sized pieces or leave whole and place in a large mixing bowl. Add in sugar and spices and toss to coat. If you are using your tested heirloom spices for the first time, it is recommended to add the mix in one teaspoon at a time. Taste an apple slice as you go and stop when you feel it is seasoned to your liking. Set aside. Roll out one disk of pie dough and fill your 9” pie pan. Trim or leave the overhang depending on how you’d like to decorate the crust. Stir the flour into the apples and fill your crust, gently pressing them down as you go - this will help them settle and keep your pie from developing a gap between the apples and top crust. Fill the pan until the apples have reached the top of the pan’s edge and are slightly domed in the center. You may end up with some left over apples depending on their size (oh heyyy snack time). Roll out the second pie dough and cover the top of the apples in any design desired. If covering with a full crust and not a lattice or cut shapes, be sure to cut a few slits in the top for ventilation. Crimp the edges and put the pie in the freezer for 10 minutes. Place the pie on a lined baking sheet. Brush with the egg wash and sprinkle with sugar, if desired. Bake in the center of your oven for 10 minutes. Reduce the heat to 350 F and bake for an additional 45 - 50 minutes. Cool on a rack for a minimum of 30 minutes before serving. Apple varieties I used in my final pie. The #1 reason people tell me they don't make pie at home is that they're intimidated by making the crust. I often hear things like 'doesn't it take a skilled baker?' or 'isn't the pre-made stuff just as good?'. I am here to tell you that both of those things are far from true. To move past this fear, the first step is to admit this is a totally rational feeling. You should never feel silly for being intimidated by something you haven't tried before. The second step is to know, understand and believe that it is actually easy. You may be thinking "of course she thinks it's easy because she cooks for a living and has done this a bunch." I thank you for giving me the benefit of the doubt, but in reality, it's just really not that hard. I will say, it's kind of messy, so be prepared for a bit of kitchen clean up. The end result is totally worth it, though. Making pie dough from scratch is about to become the easiest part of making pie and it's freakin' delicious. With that said, if you try this and mess up the first time, try it again. Don't give up on yourself (or pie!) that easily! Now, let's begin. If you've done what I often do, and just scrolled through this post you're probably thinking that this looks like a heavy post, filled with lots of information, but don't let that deter you. It's information that is helpful to know in order to make your pie dough creating experience much better. It's kind of like checkers - once you learn a few basic moves, it's actually really simple. Pie dough is all about ratios and the only thing that is "hard" about it is understanding how flour, fat and moisture work together. A brief note about flour: I use the same brand of flour (Bob's Red Mill) anytime I make pie crusts. This way, I know how it will react to my liquid. The important thing to remember here is brand doesn't really matter. Consistency does. This ratio is generalized, meaning you may end up using a little more or less liquid to flour depending on how dry your flour is or how humid the air in your kitchen is (wait don't leave - it's not really that complicated!). We'll ignore the chemistry behind this to simplify it - all you need to learn is how the dough should look (see graphics in the Visual Guide at the bottom of this post). Once you know that, you can tell if it needs more water or not. If you aren't confident on whether your dough is too dry, just remember it's always better to err on the side of too much liquid than too little, here. Any liquids you add to your dough should be ice cold. In this instance, any 'solid' fat will work. You can use butter, shortening (even the vegan shortening), lard, or others like coconut or palm oil as the fat in your crust. (All of these really do work, just not all the same way. Once you've got the basics down, start experimenting!) I prefer butter - the fresher the better, because mmmm...fresh butter - but whichever you use just make sure that it is cold. Heat is also an enemy of flakey crust, until we bake, so be sure all of your ingredients stay cold while working your dough. If using shortening or lard, I suggest placing it in the freezer for 15 minutes before adding it to your crust. If using butter, keep the sticks in the freezer and cut them when ready to use. For blending the fat into the flour, you can use a food processor, pastry blender, two knives or even your hands. My hands are naturally hot and end up melting the butter too quickly, so I prefer a pastry blender over knives and a food processor over everything. Using a small amount of alcohol or vinegar in your pie crust will promote tenderness of the crust and guard against overworking the dough. They both inhibit our frenemy Gluten from forming when the water and flour combines. Gluten is great in bread, but not usually pastry - it causes shrinkage in the oven and can make the crust tough. As I mentioned earlier, until you're ready to bake, heat is the enemy of making good pie dough. In order to get that delicious flaky crust, the fat needs to stay in solid pieces while being worked into the dough. If it melts and breaks down too much, it will create a tough dough. Try to touch your dough as little as possible - this is why I prefer using a food processor over my hands to work in the fat. Ambient temperature can influence your dough, as well. If it's warmer than 72 degrees in your house, I suggest placing all of your ingredients and mixing bowl in the freezer for at least 15 minutes prior to use, this will help to keep your fat cold for longer as you work it. When mixing the flour, sugar and salt together, you can add in an array of spices and herbs to flavor your crust. This is a great way to add additional subtle flavor to your pies that compliments its filling, without competing with it. This recipe makes dough for a single crust (double the recipe for a double-crust pie). Place the flour, sugar and salt in the bowl of your food processor and pulse twice, just to combine them. Add in the chunks of butter and pulse 5-10 times. This will vary on the size and power of your processor and the hardness of the butter. Start with 5 pulses; toss the flour around to see the size of the butter pieces. If they are bigger than the size of a lentil, pulse a few more times. Dump the flour mixture into your mixing bowl and make a well in the middle of it. If you're using alcohol or vinegar, add it now, then 3 tablespoons of your ice water. With a fork, begin fluffing the mixture together, pulling the dough off the fork as needed. Continue just until the water is mixed in (1). I find it helpful to rotate the bowl as I work. The dough is ready when about a quarter of the flour is still slightly dry and crumbly, but the rest is shaggy and clumping together. To test, grab a small amount in your forefingers and pinch it together. If it cracks and falls apart, work in another tablespoon of water. If it sticks together and keeps form, you’re set. The dough will still be loose but don’t panic! That’s how you want it. If it doesn't look like this yet, continue adding your ice water, one tablespoon at a time, and work it in the same way with your fork. Pour the dough onto a clean work surface. 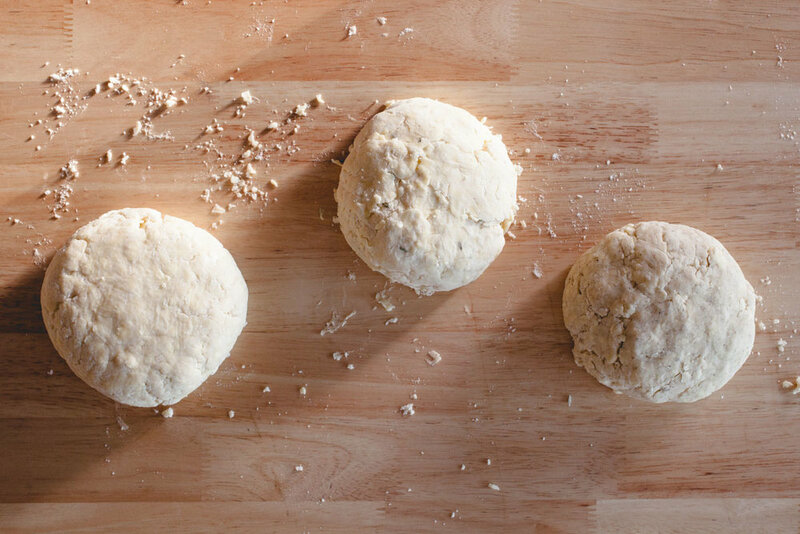 To begin, place your hands on either side of the dough and start pressing them toward the center. Repeat this move a few times to form the loose dough into a rough dome shape. Flip and fold as needed to incorporate the dry portions, but do not knead it like you would bread (1). This should only take about 30-45 seconds. Once the dough has formed into a singular mass, flatten your dome shape into a chubby disk (2). Wrap tightly in plastic wrap and refrigerate for at least 3 hours, overnight if you can. You can leave the dough in the fridge for up to three days, which means you can get a jump on your pie prep. If you want to prep your dough more than three days ahead keep it in the freezer and allow at least a day for it to thaw in the refrigerator. When you're ready to roll out the dough, allow the wrapped disk to sit out on your counter for a few minutes to warm up. Generously flour your work surface and the top of your unwrapped dough disk. Starting in the middle of your disk and roll your pin upwards with medium pressure, all the way through the edge of the dough. Move the pin back to the middle and roll your pin towards you with the same technique. Rotate your dough a quarter turn and repeat. Continue until the dough is about 1/8" in thickness. It's important to keep your dough moving as you roll it out in order to limit the amount it sticks to your surface. If you do end up with a stuck crust, a bench scraper is a very helpful tool for unsticking it. If you need to add more flour, just gently lift and sprinkle more where needed. If any major cracks appear as you roll, gently press them back together and continue rolling. When you've reached the right thickness, fold the dough in half, then in half again (top to bottom, then left to right) to transfer it to your pie pan. Unfold and gently fit the crust to form to the pan's shape. If you plan on crimping the edges, trim the excess to leave about an inch of overhang. Fold the excess over itself to the edge of the pie pan and crimp. You can also trim to the edge of the pie pan if leaving plain, adding cutouts, or putting on a top crust. Footnotes: 1. Working the dough, either with a fork or kneading with your hands, will encourage gluten development which not pleasant in pie crust. Be as sparing as you can with mixing and kneading. // 2. It is normal to have some minor cracks in or around the edge of the dough disk. Parts of the dough will still be drier than others - this is where resting the dough in the refrigerator is crucial. As the dough rests, the flour will absorb liquid, allowing those cracks to be repaired or disappear when rolling it out. Use a folding motion when mixing your dough to help keep the crust tender. Rotating the bowl at the same time helps ensure even mixing. The dough will look shaggy when finished (right). 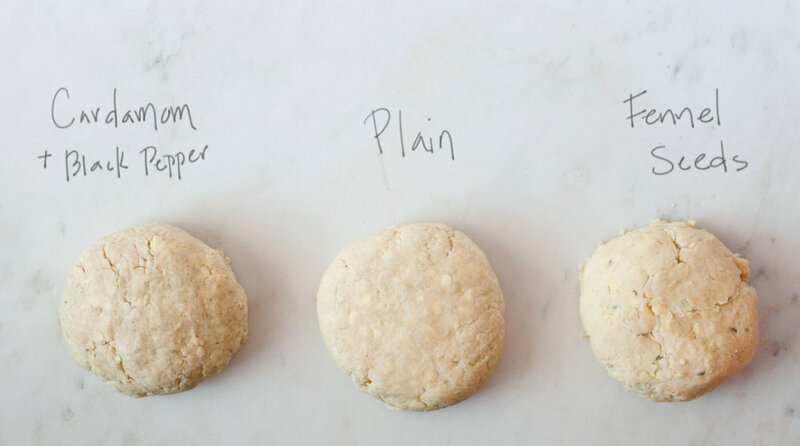 The Pinch Test: Take a small clump of dough in your hand and press. If your dough sticks and holds shape, you've added enough water. Pie dough will look very different than bread or pizza dough. Small cracks in the surface are totally normal and acceptable. This is what helps develop a flaky texture and any cracks can be repaired when rolling it out. If you are unsure of just how to roll out your crust, there's a super exciting video below showing you (really, the video is in real time because I find it helpful to learn by watching someone perform a technique I'm unfamiliar with). For a single crust, fill your pan with your rolled crust, fold over or trim any excess and crimp the edges. For a double crust, fill your pan as you would for a single crust, but trim or leave the excess without crimping. Fill the pie and roll out your second (top) crust and cut or decorate how ever you desire. Pinterest is a great resource pie design inspiration! Follow the directions for Bon Appetit's Basil-Chip Ice Cream base, just prior to adding it to your ice cream machine, and keep in the refrigerator until you're ready to freeze. To make the pie's crumb crust, place the Biscoff cookies in a food processor and blend until finely crumbled. Empty into a medium sized mixing bowl. Add to the bowl, cocoa powder and almond flour and mix thoroughly. Add the melted butter and stir until the crumbs are evenly moistened. You may want to ditch the utensil and use your fingers to finish mixing. Spoon the mixture into a 9" pie pan and begin patting it down and up the sides of the pan with your fingers or the back of a soup spoon. Be conscious of getting the layer of crumb even, or your ice cream may soak through later on, making it difficult to remove your slices. Once the pie pan is evenly coated, place in the freezer for 1 hour. Pick-up where you left off in the ice cream recipe by adding the base to your ice cream maker. The freeze time will depend on your machine, so look for the ice cream base to almost double in volume. When it's done, it should be about the consistency of greek yogurt if you take a spoonful of it. Remove your pie pan from the freezer and very carefully spoon the ice cream into the crust. Fill just before it reaches the top of the crust. Return to a level surface in the freezer, and freeze for a minimum of 4 hours. To serve, run a sharp paring knife under hot water for 10 seconds. Wipe dry and cut the pie into slices. Spoon Elderflower Strawberries and syrup over each slice, or serve with fresh sliced strawberries. I believe there is a necessity for us to be connected to our food. It makes us aware of seasons and life cycles. It reminds us that vital functions on earth are unplugged. It gives us a unique way to express creativity and build community. I hope the recipes and thoughts shared here Inspire you to make something delicious for someone you love (or just yourself!). Sarah Ward is the Food Editor for Taste of the South and Southern Cast Iron magazines. Currently enjoying life in Birmingham, AL with her husband and their polydactyl cat, Jack. Get new recipes delivered right to your email. Thank you! Looking forward to staying in touch. For now, head on over and say hi here. © Sarah Ward and of the dirt, 2017. Unauthorized use and/or duplication of the photographs and recipes without express and written permission from this blog’s author and/or owner is strictly prohibited. Excerpts and links may be used, provided that full and clear credit is given to Sarah Ward and of the dirt with appropriate and specific direction to the original content.